Mains Operated Soldering Irons, Manufacturer, Supplier, Pune, India. We are Manufacturer, Supplier, Exporter of Mains Operated Soldering Irons, Soldering Iron. Soldering iron is developed according to international standards and rigorous R & D incorporation necessary feature for professionals and hobbyists. Soldering iron is light in weight and has a compact design with thermoplastic handle having low temperature grip and easy handling. Soldering iron provides high reliability and flexibility to handle most soldering jobs from professionals to hobbyists. 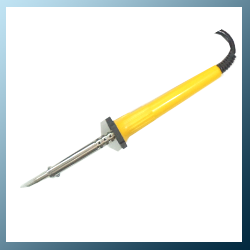 Our soldering iron is durable and has a high reliable heating element with high insulation. Though at the tip there’s no leakage current and constant temperature is maintained.